Author Robert Layton has a passion for monuments, and the historical significance they carry. Read on to see some Robert’s thoughts on some of the most influential monuments in Richmond, Virginia! Richmond Virginia has had a lot of press about their monuments. Contrary to what you may have read, the capital of the Commonwealth has not completely succumbed to the controversy. The city that has endured storm, fire, flood, earthquake, and war has once again overcome adversity. Monument Avenue, the internationally popular boulevard, gets most of the current press. But the City on a Hill displays a wide-variety of outstanding monuments and memorials which reflect its herald past, highlighting its accomplishments extending beyond the Civil War debate. Visitors have an opportunity to learn of the contribution of leading citizens from Arthur Ashe to George Washington. Other positive presentations include recognition of military units, police detachments, early church influence, and such diverse subjects as the Holocaust and slavery. The honorariums include the role of medicine, railroads, universities, organizations, public art, and historical events in the diversity. To illustrate, I’ll share some of my favorite monuments that are easy to get to. A moving presentation by former Richmond resident and well- known Virginia sculptor, Linda Gissen. The emotional statue was commissioned by Bishop Walter F. Sullivan of the Catholic Diocese of Richmond, as a part of a major interfaith gesture, which was believed to be the first of its kind. Ms. Gissen, who donated her time, completed the work in bronze and copper. 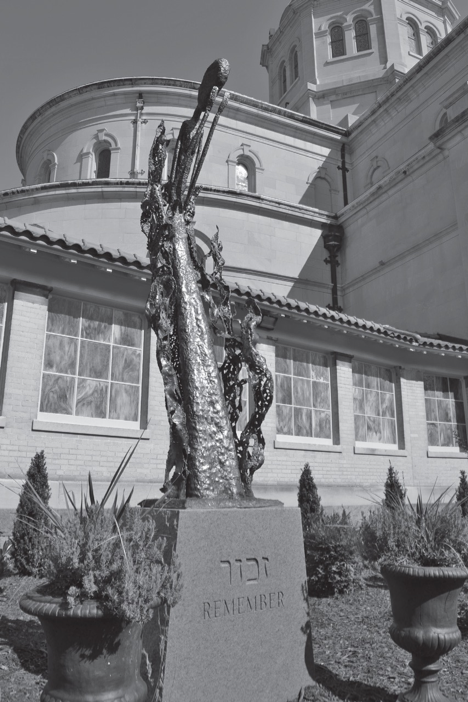 The statue shows a weeping woman (“Rachel Weeping, for Her Children”) surrounded by six leaping tongues of flame representing the 6 million Jews who perished in the Holocaust. Placed on the south garden of The Cathedral on Park Street the statue cries out for your visit. For years this English Busker brought a smile to all that passed by on busy 6th Street. With his trunk of tricks behind, a dog in his right hand, his vest on backward, and a teddy bear in his rear pocket, he raised a friendly wave accompanied by a big smile to cheer all that happened by. Few noticed the street entertainer had a mouse on his head. The same wit that brought us “Bojangles” did this piece; Jack Witt, who is a talented local sculptor. Mr. Smedley was removed from the above position in preparation for the renovation of the new performing arts project. He can now be seen hanging out on Jefferson Hill in the East end. The clay piece, originally intended for inside use, was enthusiastically received and changed to its prestigious position in front of the building. The creation is by Alan Rosenbaum, a member of the instructing faculty at the highly-rankd Virginia Commonwealth School of Sculpture. 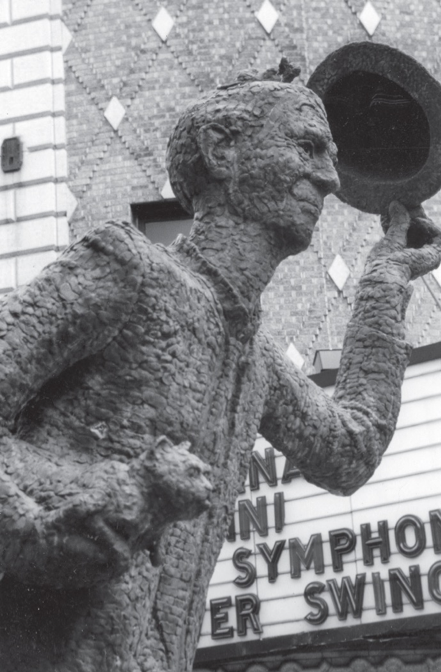 Mr. Rosenbaum’s specialty was ceramics, and this was his first rendering in bronze. 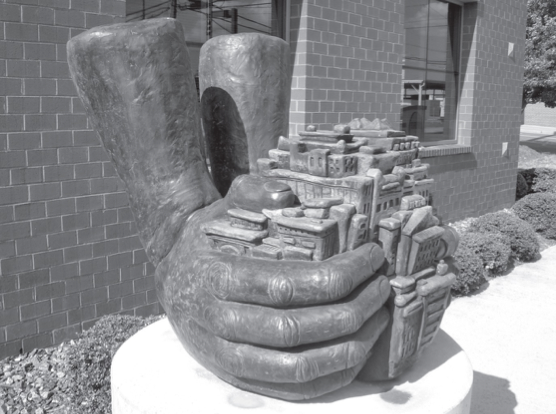 An apology for slavery, this fifteen-foot sculpture stands close to the city’s former slave market, and takes its place as a part of Richmond’s Slave Trail as a reminder of the city’s role in the slave trade. 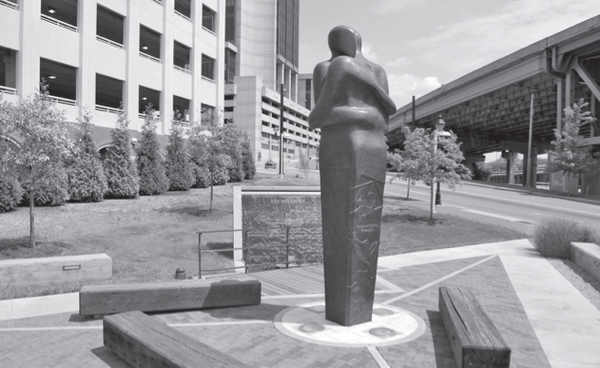 The rendition shows two people embracing in front of three large benches that triangulate the statue. A fountain carries captions (read through cascading water) describing the significance of the statue. The messages identify the three regions; Liverpool, England, The Begin Region of West Africa, and Richmond, Virginia. Acknowledge and forgive the past. Embrace the present. Shape a future of reconciliation. It then continues with more detail on the unspeakable horrors of this infringement on human dignity. Identical statues appear in Liverpool, England and Benin, West-Africa. At the Capitol, a wide range of honors featuring Virginia dignitaries and our founders are displayed. Leading this contingency, the famous Houdon statue of George Washington stands proudly in the Rotunda. Many consider this magnificent piece to be the most valuable statue in North America. The popularity of this priceless sculpture is attested to by the fact that it has been replicated over 35 times and appears all over the world. Robert Layton has published over 150 articles for more than 35 different publications. He has given over 200 lectures to a wide variety of audiences on subjects ranging from monuments and travel to history and animals. An avid traveler, Layton makes his home in Glen Allen, Virginia. Phil Riggan is a photographer, blogger, outdoorsman and volunteer in Richmond. He is a contributor to Richmond.com and founder of RichmondOutside.com. For a more in-depth look at Richmond’s history, check out Robert’s book below! What do you think of these Richmond monuments? Let us know in the comments below!